Jan. 15, 2014 10:00 a.m. 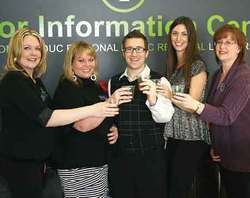 The staff at the Chamber raised a glass to the coming year at their open house held over the Christmas season. As much as they love what they do, the break over Christmas and New Years is a welcome breather for the hard working staff at the Leduc Regional Chamber of Commerce. With the innumerable number of events, luncheons and grand openings the Chamber organizes and attends every year the time off is definitely well earned. Of course this time of rest and relaxation is just long enough to catch their breath and rejuvenate in time for everything to get rolling again, and the staff wouldn't have it any other way! The team at the Chamber consists of Shaun Green, Executive Director, Jennifer Garries, Member Services Coordinator, Tracy Hartfelder, Events Coordinator, Jessica Roth, Communications and Marketing Coordinator, and Pamela Fouillard, Office Coordinator. The efforts of these five individuals help put together ten chamber luncheons every year, each with a different topic, speaker and setting, a business expo, the Festival of Trees, a Women's Conference and numerous smaller, in-house events to name just a few. The next event on the Chamber's agenda is their first luncheon of 2014. This luncheon is historically a "state of the union" type address from the Mayors of both Leduc City and County. Always a popular and usually sold out event, this year the luncheon, which will be held on January 24th at the Executive Royal Inn, should prove to be extremely interesting with all of the growth and expansions within the City and the contentious annexations proposed for the County. The February luncheon follows right on the heels of January's on February 7th and then one of the largest Chamber events of the year takes place on February 22nd, and that is the Annual Chamber Gala and Business Awards. One of the premier events on the Leduc calendar it is a formal event that embraces a different theme every year. In years past the decor and entertainment centered around themes such as "A Night At The Opera" and "Mardi Gras". This year, in honour of the upcoming Olympic Games, the theme is "Celebrating Champions". In April the Business Expo takes over the curling rink at the Leduc Recreation Centre with dozens of local businesses and services showcasing everything from gourmet candies to new cars. May has the team involved in many aspects of the Black Gold Rodeo, including the running of the parade. Over the summer months everyone is run off their feet keeping up with the long hours manning the Tourist Information Centre and the thousands of tourists coming to, and passing through, Leduc. September brings the Women In Business Conference that features amazing main speakers every year and a plethora of different workshops designed specifically for women in the workplace. In the blink of an eye the Festival of Trees is upon them again and this huge undertaking that raises thousands of dollars for local charities and incorporates several smaller events such as the Small Business – Big Christmas Party and the Spirits of Christmas is all flawlessly organized to run over one crazy weekend. This is only a tiny fraction of the things held within this area that the Leduc Regional Chamber of Commerce has a hand in hosting and running. Sometimes the people behind the scenes that are working so hard for the betterment of all need a little acknowledgment, so to the fabulous team at the Leduc Regional Chamber of Commerce, thank you! You are part of the reason Leduc and County is such a great place to live and work!